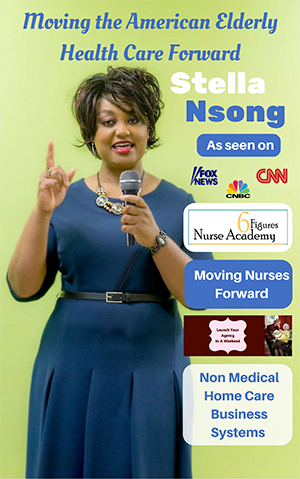 Following a PBS Frontline exposé on abuses in assisted living facilities, professional geriatric care manager and elder care expert STELLA NSONG urges families to execute the appropriate legal documents to ensure that the right person has the authority to direct and provide the best and safest care options possible. Assisted Living resident faces arrest for stealing airport rental car, leaves an emergency room AMA, hitchhikes to his now vacant townhouse, no one has the “legal authority” to transfer the resident to a dementia care unit…..….other citizens placed at risk. On the heels of a PBS Frontline 4-part investigative series which identified serious quality of care and patient safety problems in some assisted living facilities, the National Association of Professional Geriatric Care Managers (NAPGCM) released the results of a survey that offers critical advice to protect the growing number of seniors living in assisting living facilities. Stella Nsong president of The CAREgiving Institute responds and connects the dots (through a book titled The Caregiver’s Cliff Notes: 27 Things To Do When Your Parents Are Losing Their Independence) between PBS’s investigative series and NAPGM findings especially for an assisted living resident who is quite unsafe and places the entire city at risk but cannot be transferred to a dementia care facility for lack of a power attorney or guardian. Too often families don’t have the information and the legal documents they need to ensure their loved ones residing in assisted living facilities are safe and receiving quality care. Legal documents become extremely important when there is a change in the amount of care needed necessitating a move to a different facility or a different area of care in a continuum of care community. Nationwide, there are about 735,000 older Americans who reside in assisted living facilities. The typical resident is a woman about 87 years-old who is mobile, but needs assistance with approximately two to three activities of daily living, such as bathing, dressing and toileting. The number of Americans turning to assisted living is growing with the greying of babyboomers. “Quality of care and QUANTITY OF LIFE are two important parts in the care of an elderly person but the driving force of care is a competent, balanced and informed family caregiver with the correct documents needed to direct and execute care”……..Stella Nsong. In the case of this resident, here is what family caregivers and health care professionals can learn from The Caregiver’s Cliff Notes: 27 Things To Do When Your Parents Are Losing Their Independence. Chapter 2 covers the role of a care manager: What To Do When Everything Has Hit The Fan. A care manger can serve as a liaison between the facility, the family and the legal system to explore solutions for the discharge planning process. Chapter 5 is very useful for the children of this resident who live out of state. This chapter discusses 5 things to do when your parents are resistant to care. 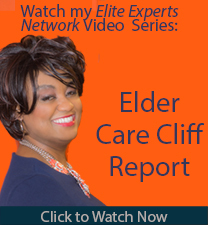 Chapter 7 details how to delay or avoid nursing home placement and chapter 9 walks you through the process of determining the amount and level of care needed in an assisted living and how to choose the right facility for your loved one. There is also a success story of how an assisted living resident at the Woodlands at Eastland thrived and is now in independent living enjoying a very full life. Chapter 10 helps everyone put their own individual long term care plan into place. The Caregiver’s Cliff Notes is succinct, concise and to the point with simple and actionable steps to help caregivers prepare both legally, financially and emotionally for their roles as caregivers. At the end of each chapter there is a check list and by the time the caregiver gets to the end of the book and has checked all the boxes, he/she will have everything needed to provide a good quality of life and safe care for loved one. The Caregiver’s Cliff Notes is an easy read in 2-4 hours. It is available in paperback at local book stores nationwide. Here are the top 5 tips for ensuring that your love one receives safe and quality care in assisted living. #1. Before choosing a facility, check with state or local licensing agencies and the local long-term care ombudsman to ask if the facility has had safety or quality problems or complaints. If there have been problems ask what they were, when they occurred, and how they were resolved. #2. Visit your loved one often. If you live out of town, or are unable to visit, ask other family members and friends to visit. #3. When you visit, eat the food, observe the residents and their interactions with staff, and talk to other families who visit their loved ones. The more you are involved and know the residents and staff the more you will be able to identify and address concerns. #4. If your loved one has dementia, learn how the facility assures their safety, including how they protect residents who are inclined to wander and if staff has appropriate training to respond to this and other behaviors associated with dementia. #5. If your loved one begins to need more care than the facility provides, obtain an independent professional assessment to determine if the facility is still appropriate for them. Many assisted living facilities do not provide one on one care. A loved one needing individualized care may need additional help hired independently, to be moved to a facility with more care, such as a nursing home, or may need hospice to be initiated. A professional geriatric care manager can be your “eyes and ears” as an advocate and a partner in assuring quality care for your loved one in the facility. 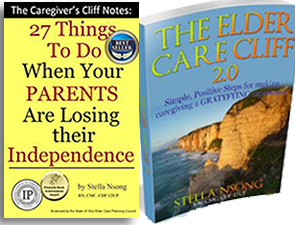 The caregiver’s Cliff Notes: 27 Things To Do When Your Parents Are Losing Their Independence is self published to benefit the caregiver support services developed and offered by the CAREgiving Institute. To place a bulk order please call 440-358-1718.